"Families by the Sea" Reverse floor plan (living area, kitchen, master bedroom on top floor) allows you to enjoy the great ocean views from the living area and kitchen of this second row duplex. There are 3 bedrooms and 2 baths (units adjoin if both sides are rented) making this a great option for small families or you can rent both sides for larger groups. Covered and open decks, with terrific ocean views from the new Polywood outdoor deck furniture on the second floor deck. Conveniently located, it's a short walk to either of two beach accesses to a beautiful wide beach to enjoy, no matter the tide. Equipped with a large LCD flat screen television, a second cable television in the master bedroom, hi-speed wireless internet, dishwasher, microwave, washer/dryer, DVD player, ceiling fans, hot/cold outside shower, covered parking, charcoal grill. Beautiful PRIVATE POOL, shared with duplex, complete with 6 lounge chairs for sun bathing, reading, or just plain relaxing. There are 2 bedrooms and a bathroom on the first floor, with the bedroom at the rear of the first floor equipped with bunk beds, making it a perfect location for kids to stay. 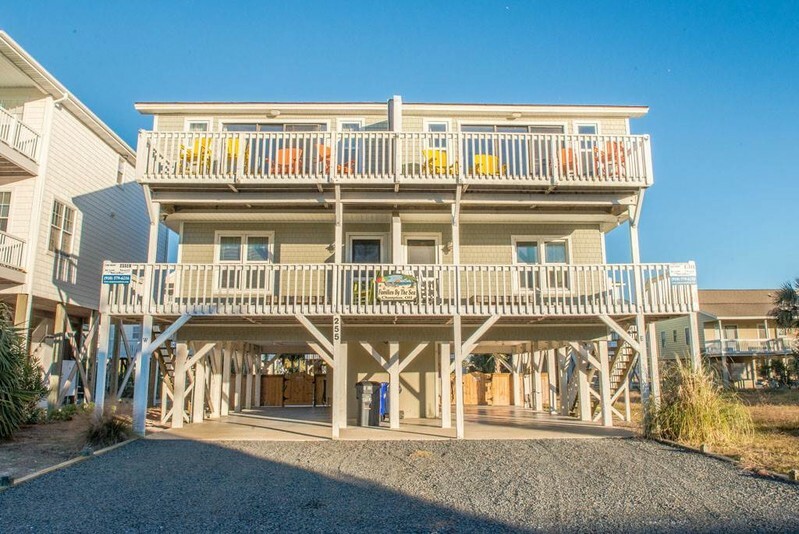 This unit sleeps 10: upstairs has 1 king and a queen sleeper sofa; Downstairs has 1 queen, a queen and bunk beds. Kitchen is well-equipped with cookware, and includes coffee pot, toaster, crock pot. Refrigerator has an ice maker. Family room updated with new coastal themed furnishings and new flooring. All bed and bath linens provided in the rental rate: beds will be made upon your arrival. Non-smoking and no pets. This duplex is our favorite place we have stayed at so far. This is our 5th time to he beach and think this is the one great set up with 2 bedrooms downstairs and the master and kitchen upstairs. The view is unbeatable and we love the pool. I would highly recommend this place. We booked this one last second for a quick getaway with the kids. We had 3 adults and 5 kids. The duplex has a nice layout with 1 bedroom upstairs, along with family room and large deck. 2 of the bedrooms are downstairs, especially the one for the kids. That way the adults could stay up later when the kids went to bed. Very short walk to the beach, less than 100 yards. Ocean Isle was great as always.